Palaeontology typically relies on fossil studies, in particular morphological differences, to reconstruct and interpret patterns of vertebrate evolution. However, genetic studies of population histories of extant species provide data about past population events (e.g. local extinctions, recolonisations) which are equally relevant to palaeontological questions. This study used morphological traits to evaluate a hypothesis based on genetic evidence that southern African impala (Aepyceros melampus) are the founder population for all other living African impala populations, after an eastern African extirpation event dating to around 200 000 years ago. Measurements of three horn metrics and the presence or absence of a particular dental trait were compared across four regional impala samples. Eastern African impala possess a unique combination of larger horns and a significantly higher occurrence of entostyles when compared to other impala populations. These traits are likely to have characterised a small group of founding impala which recolonised this region. This pattern appears consistent with the genetic evidence that a subset of the southern African impala gave rise to the eastern African populations. Other species with complex population histories, such as wildebeest, eland, topi and hartebeest may also therefore be expected to express variation in certain morphological traits in the fossil record because of similar patterns of recolonisations. The process of local extinction and subsequent repopulation over shorter timescales (102  103 years) may pass unnoticed in the fossil record, and lineages may appear uninterrupted. Instead, greater morphological variation within a species may be observed, which may be misinterpreted as reflecting a speciation event, or ecophenotypic variation. Combining data from genetic studies and palaeontology may provide further clues as to how faunal dispersals within Africa shaped the morphological variation in the fossil record, and how to best interpret such differences. Of all the African antelopes subjected to genetic studies to date, the impala stands out as an intriguing mix of evolutionary simplicity and complexity, offering a unique record of antelope evolution in Africa over several million years. Some authors consider this bovid tribe, the Aepycerotini, to be 'living fossils', little changed over the course of their evolution.6 With apparently almost no speciation during the Plio-Pleistocene, they contrast markedly with other, more speciose tribes, such as the Alcelaphini or the Antilopini. Impala are widespread in modern times, inhabiting savannah environments over a discontinuous distribution throughout sub-Saharan Africa.11,12 Only males possess ridged, thin, S-shaped horns. In present-day South Africa, impala are confined to game reserves and, as reintroduced populations, to the eastern coast of South Africa (Figure 1). Because this species has been well studied, from behavioural, genetic, palaeontological and morphological perspectives, it provides a useful model to assess whether or not variation in morphological traits can be reconciled with current genetic evidence of population history. Several previous studies have examined geographic variation of impala, using both craniodental and horn morphology,2,15,16 other studies have examined how pelage differences relate to previously recognised subspecies. Horn dimensions differ between impala populations (subspecies) and this 'diversity may have genetic, evolutionary, ecological or biogeographic importance'16. Lorenzen and colleagues used their study of genetic diversity and spatial population structuring to deduce that southern Africa is the founder population for all modern impala.4 The genetic perspective appears at odds with the current fossil evidence, where impala are abundant in many fossil sites in eastern Africa, but are sparsely represented in the southern African sites. 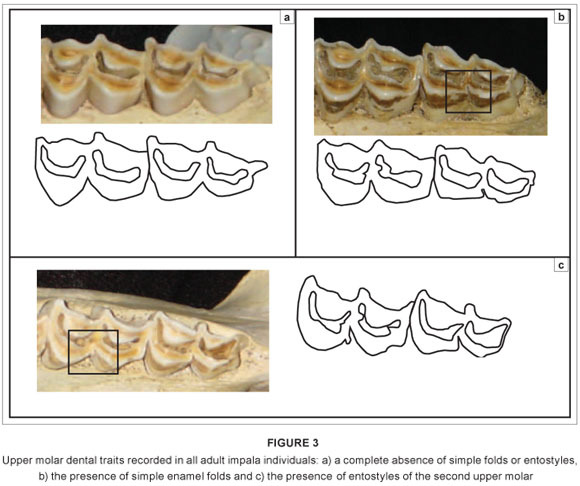 In this study, I therefore used horn metrics and the presence or absence of simple folds and basal entostyles in the upper molar teeth of impala samples across their geographic range to test for regional differences, and to establish whether there are morphological traits which could support the genetic hypothesis. 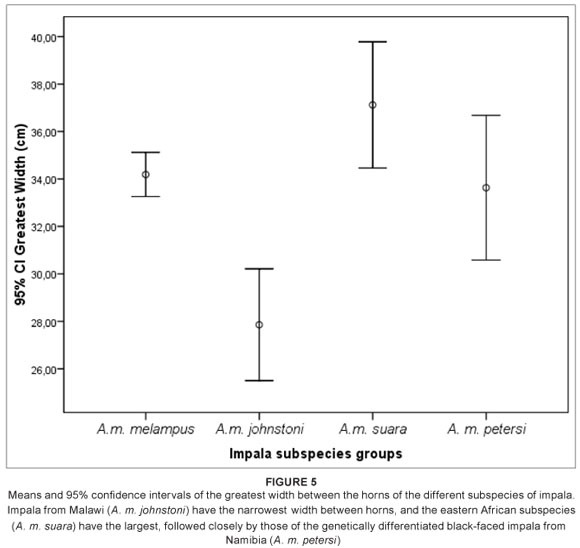 A total of 276 modern impala skulls of both sexes from four African regions were examined (Table 1). Both adult and sub-adult (third molars erupting) specimens were included. Only wild-caught specimens with known country provenance were included. 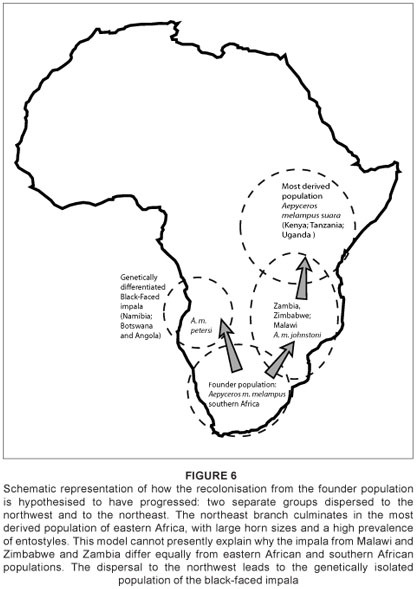 The impala were divided into four groups corresponding to geographic localities, in order to characterise the degree of potential variation from each region. Group 1 (A. m. melampus) represents the subspecies from the Republic of South Africa, while Group 2 (A. m. johnstoni) represents those from Zambia, Malawi and Zimbabwe. Group 3 (A. m. suara) represents Uganda, Kenya and Tanzania and includes the subspecies A. m. rendilis, which is considered a synonym for A. m. suara.16 The final group, Group 4 (A. m. petersi), contains the rare black-faced impala from Angola, Namibia and Botswana. Specimens were studied at the National Museums of Kenya (Nairobi), the Natural History Museum (London), the Powell-Cotton Museum (Kent), the University Museum of Zoology (Cambridge), the University of the Witwatersrand (Johannesburg) and the Northern Flagship Institute (Pretoria). The large horn dimensions of the eastern African impala, A. m. suara, are considered by several authors to be a diagnostic feature of this subspecies.12 However, while the eastern African subspecies does possess the largest means of all three horn metrics examined (Table 2), the total length of the horns of east African impala (Group 3) were not significantly different to that of the South African (Group 1) impala (p > 0.05, Mann-Whitney U test; Tables 2 and 3, Figure 4). 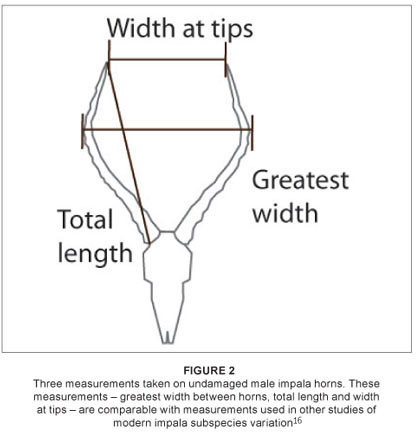 The only metric which differed significantly between these two groups was the greatest width between horns, with the eastern African impala having a significantly greater mean width between horns (p < 0.05, Mann-Whitney U test; Tables 2 and 3, Figure 5). The overlap between Group 1 (A. m. melampus) and Group 3 (A. m. suara) therefore renders this trait less useful as an indicator of a particular subspecies in every case (Figures 4 and 5). However, for the Group 2 impala (from Malawi, Zimbabwe and Zambia), all horn metrics were found to be significantly smaller than in their counterparts from either eastern or southern Africa (Tables 2 and 3)  a pattern which strongly differentiates this subspecies (A. m. johnstoni) from all other subspecies (Figures 4 and 5). 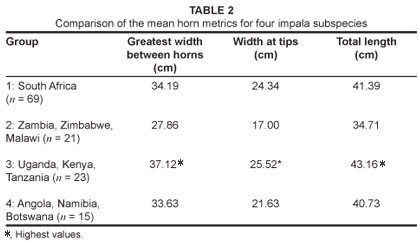 The horn metrics of Group 4, the black-faced impala, were most similar to the southern African impala, with all three horn metrics not being significantly different (Table 3). 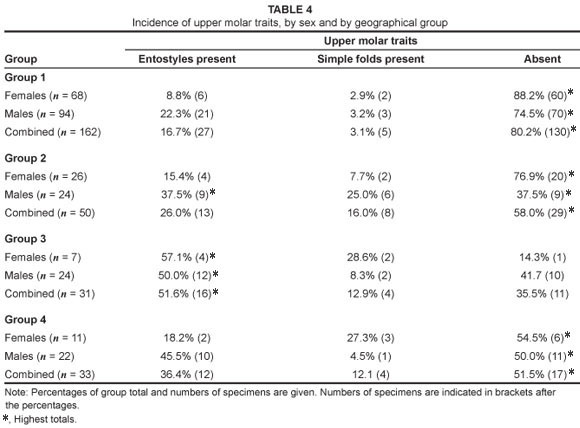 For the dental traits, teeth of both sexes had simple folds and entostyles, although these traits were not equally distributed between males and females (Table 4). Increased sample sizes may clarify whether or not there are differences between sexes, and why such traits may differ. Entostyles were most commonly observed in the eastern African impala, occurring in 51.6% of specimens. In contrast, only 16.7% of the South African impala (Group 1) had entostyles (Table 4). The genetically differentiated black-faced impala, A. m. petersi (Group 4), had the second highest occurrence of entostyles at 36.4% (12 of a total of 33 specimens). The occurrence of entostyles in Group 2 (A. m. johnstoni) was intermediate between the southern and eastern African groups, occurring in 26% of specimens (Table 4). Simple folds were most common in Groups 2 and 3 (occurring in 16.0% and 12.9% of specimens, respectively; Table 4). They occurred least often in the South African group, with only 5 of 130 specimens (3.1%) having simple folds. Variation in both metric and non-metric traits is often observed in geographically widespread species. One of the most common forms of geographic variation is body size clines, with larger-bodied conspecifics found in South Africa and smaller-bodied individuals in eastern Africa. This pattern has been interpreted as a selection for larger body sizes in more seasonal southern African environments2,15 and has been identified for several species including spotted hyaena (Crocuta crocuta) and plains zebra (Equus burchelli). While the geographic variation in these species is easier to understand in terms of seasonality differences, impala show a pattern consisting of (1) a lack of body size differences between regions, (2) slight horn size differences (except for the greatest width between horns) and (3) a greater number of entostyles in the eastern African impala. These data do suggest that the populations of impala may have undergone different population histories relative to the spotted hyaena and plains zebra. The local extirpation and recolonisation pattern has not been observed for the other two species and may account for the complex regional patterns visible in impala. While the presence of entostyles have been inferred to be a primitive trait,20 within the context of this study, it appears that characteristics such as horn size and entostyles, may increase and decrease through time in response to the extirpation and recolonisations of certain subspecies. As a result, even though the geographic range is seemingly continuous, the localised effects of other variables, such as disease outbreaks, inbreeding effects, or climate changes, may act over smaller spatial and temporal scales. In essence, regional populations may function as separate evolutionary entities, influencing how morphological variation appears in the fossil record. The recent population history of impala clearly illustrates how regional populations (or subspecies) do not share the same evolutionary trajectory, with one population surviving for ca. 200 KYA in the south, while another failed to survive in eastern Africa. Given that the Aepyceros lineage stretches back to between 4 MYA and 7 MYA, at Lothagam, in northern Kenya,7 it is reasonable to assume that this scenario of population extirpations and recolonisations would have been repeated in different places within the temporal and geographical range of this genus. 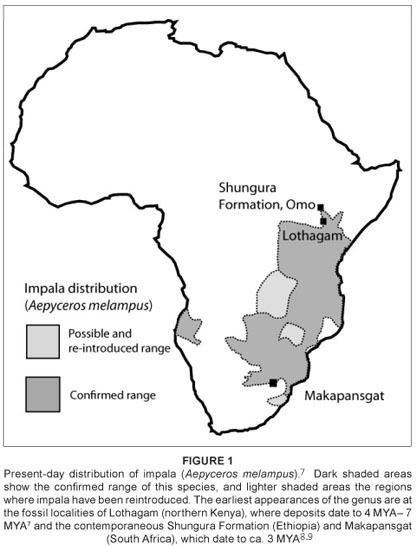 For instance, it is possible, given the dearth of Pliocene impala material in southern Africa, that the Makapansgat impala population may have been extirpated and later replaced by a different population of southward-dispersing impala, possibly originating in eastern Africa. In order to test this type of scenario, it may be more informative to consider entostyles and other distinguishing morphological characteristics as population markers, rather than traits which are uniformly 'primitive' or 'derived'. The presence and absence of such traits could indicate possible genetic relationships between regional groups through time, even beyond the timescales for which genetic population studies can provide information. 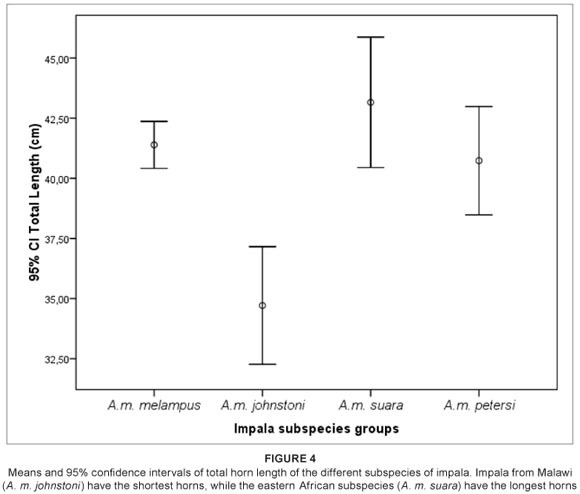 Two traits which differ among the four impala populations have been identified. 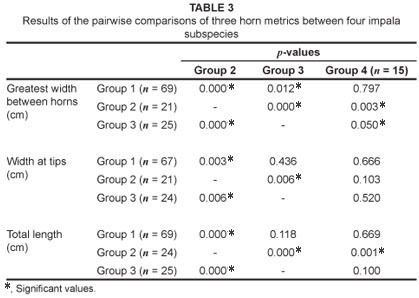 The A.m. suara subspecies from eastern Africa have the largest horn metrics measured in this study, as well as the highest occurrence of entostyles (51.6%). While it is not possible to know exactly why the distribution of entostyles and specific horn sizes differ among regional populations, the recent genetic studies provide a framework within which such variation can be interpreted. In the light of the genetic evidence,4,5 differentiation of horn and upper molar traits can be interpreted as a result of the dispersal of impala populations from a founder population elsewhere. The high occurrence of entostyles in the eastern African region suggests that the founder population that recolonised this region possessed high frequencies of this trait. While entostyle loss is considered a derived trait20 here the entostyles in the eastern African impala do not represent a 'primitive' population; instead the trait appears to dominate this subspecies because it was more prevalent in the population which dispersed to eastern Africa. In the fossil record, such processes of local extinction and repopulation of areas over shorter timescales (in this case, approximately 200 KYA) may be virtually palaeontologically invisible, apart from cases similar to this one, where population genetics is able to contribute an alternative perspective on species changes in the past. Instead, fossil lineages may appear continuous, but with possible variability in certain traits, which could be interpreted as speciation, or ecophenotypic adaptation to different environments. This pattern may be even more relevant for extinct species, where palaeontological and palaeoclimatic evidence alone must be used to develop scenarios of adaptation, endemism and extinction. Extant species with similarly complex population histories would also be expected to show some morphological variation as a result of population changes after the Pleistocene climate shifts. Species such as the wildebeest, eland, topi and hartebeest, may possess somewhat different morphological traits in the fossil record. The combination of genetic population studies and morphology studies can potentially provide further clues as to how mammal dispersals within Africa shaped the morphological variation observed in the fossil record. This research received support from the SYNTHESYS Project http://www.synthesys.info/ which is financed by European Community Research Infrastructure Action under the FP6 'Structuring the European Research Area' Programme. Part of this research derived from my doctoral studies at the Liverpool John Moores University, Liverpool, United Kingdom. Meredith Robinson kindly assisted with the data collection in Johannesburg. I thank the curators of the Northern Flagship Institute (formerly the Transvaal Museum, Pretoria), the Bernard Price Institute, University of the Witwatersrand (Johannesburg), the Natural History Museum, (London), the National Museums of Kenya (Nairobi), Powell-Cotton Museum (Kent) and the University Museum of Zoology (Cambridge) and the museums for access to their comparative collections. © 2010. The Authors. Licensee: OpenJournals Publishing. This work is licensed under the Creative Commons Attribution License.